The 2012 World Series of Poker continued on Thursday as the final 31 runners of a 526-player field returned to battle it out for the Event 58: $3,000 Pot-Limit Omaha Hi-Low Split 8-or-Better title. Unfortunately, the fate of the gold bracelet and $330,277 first-place prize would not be determined until an impromptu Day 4, where Viacheslav Zhukov ultimately captured both. On Day 3, which occurred on Thursday, Felicia Johnico began the day as the chip leader with 397,000, which helped her early on, as the eliminations came at a rapid pace, but it would not carry her to the final table. After 20 eliminations, only 11 players were left when a monster pot developed. The preflop action remains unknown, but on a flop of with 200,000 already in the pot, Roch Cousineau ended up being all in for 513,000 and at risk against Johnico. Cousineau had flopped top two pair and the nut low, which was ahead of Johnico's top and bottom pairs with the second-nut low. The turn gave Cousineau a full house, but it'd be the on the river that would secure him the entire pot, worth a whooping 1.3 million; meanwhile, Johnico was devastated and left with just 30,000. Needless to say, she was the next player to go. 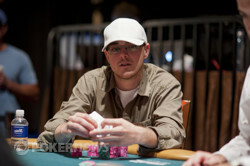 After Daniel McNally was eliminated in tenth place, the final table was set. It didn’t take long for the first elimination of the final table to occur, and it happened when Juan Ramirez fell to Cousineau, who was the massive chip leader. From there, David “ODB” Baker went on a bit of a tear quartering the chip leader, eliminating Scotty Nguyen in eighth place, and then vaulting into a big chip lead after eliminating Jack Ward in seventh place. As if that wasn’t enough, Baker went on to eliminate Yuval Bronshtein in sixth place, though Chris Bell would score the next elimination when his beat Randy Ohel’s after the board ran out . Ohel, who won Event #22 $2,500 2-7 Triple Draw Lowball earlier in the series, fell short of his second bracelet of the summer, instead taking home a $75,662 consolation prize. Four-handed play was an extended affair, but eventually a big hand developed when Cousineau opened for 115,000 under the gun and Baker defended from the small blind. The latter checked the flop, but then check-raised Cousineau's 180,000 bet the size of the pot. Cousineau simply said, "All in," and Baker got in for around 900,000 total. It was a bad spot for Baker as Cousineau held the better heart draw, an open-ended straight draw, and low outs if it came runner-runner. The turn was a dagger through Baker's heart as it gave Cousineau the said straight, while the sent Baker out the door in fourth place and putting an end to his dreams of a second bracelet. The three remaining players battled out for another hour or so on Day 3, but the chips were eventually bagged up, with Bell, Cousineau and Zhukov forced to take the night to dream about securing the bracelet. Here is how the chip stacks looked heading into the fourth and final day. Bell, who started the day as the short stack, would succumb to the rail in third place early in the day. Bell's last hand saw him all-in preflop holding against Zhukov's . The board ran out and it was over for Bell. Zhukov would start the heads-up battle with almost a 2-1 chip lead, but it wouldn't be an easy ride from there. The lead would exchange hands multiple times, but inevitably the last hand of the night would play out around three hours after heads-up began. Cousineau fought gallantly to finish in second place, making this his second final table of the summer after being on the final table of Event 47: $1,500 Pot-Limit Omaha Hi-Low Split 8-or-Better. 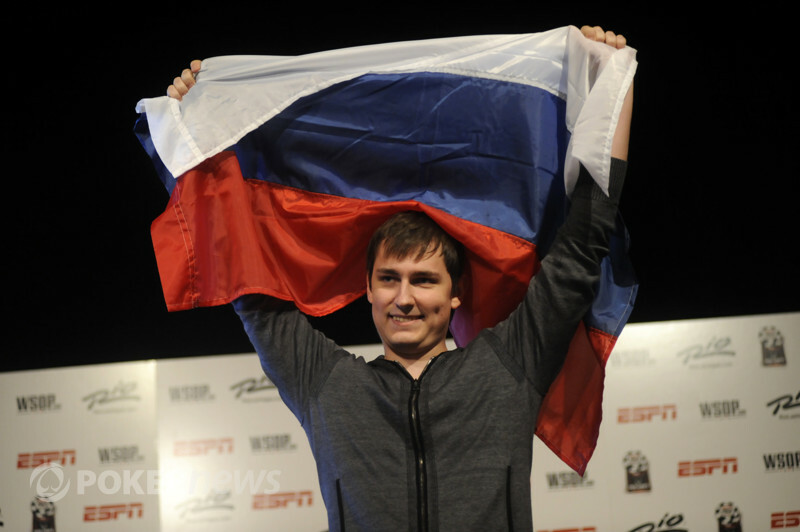 Zhukov can now call himself an Omaha Hi-Low specialist, with today being his second bracelet in this form of poker after winning the $10,000 Omaha Hi-Low Split-8 or Better Championship in 2011. That does it for our coverage from Event 58: $3,000 Pot-Limit Omaha Hi-Low Split 8-or-Better, but there are still a few events left in the 2012 WSOP. Be sure to visit our Live Reporting Section to learn which ones are happening now and be sure to follow along with this year’s Main Event! The last hand of the fourth and final day of Event 58 has just been played out, and it started like this. Viacheslav Zhukov had the button and raised to 250,000. Roch Cousineau then shoved all in for 755,000 from the big blind. Zhukov called and the two players turned their hands over, with Cousineau at risk. The flop was not good for Cousineau and the turn and the river would send him to the rail in second place, while Zhukov wins his second World Series of Poker gold bracelet. One of the largest hands of the day has just played out and it went like this. Viacheslav Zhukov limped the button and Roch Cousineau called. On the flop, Cousineau check-called a bet of 100,000. Cousineau then check-called again on the turn, this time a bet of 300,000. The on the river would see Cousineau check-call a bet of 500,000 and the two players would turn their hands over. Zhukov scooped the big pot with the nut flush and Cousineau was left crippled. This is the biggest chip lead of the final day so far. Roch Cousineau had the button and raised it up to 225,000. Viacheslav Zhukov then re-raised the pot and it was 675,000 to Zhukov. Cousineau thought for quite some time before making the call. When the dealer spread out a flop, Zhukov slid out a 1,350,000 pot-sized bet and Cousineau quickly folded. Viacheslav Zhukov had the button and limped. Roch Cousineau then raised it up to 300,000 and Zhukov called. On the flop, Cousinea and Zhukov both checked and it was on to the turn. Cousineau led for 350,000 here and Zhukov promptly raised the pot. Cousineau didn't want to continue, letting his hand go and sending the pot to Zhukov. Roch Cousineau was on the button when he raised it up to 200,000. Viacheslav Zhukov called in the big blind and the dealer turned over flop. Zhukov checked here and Cousineau bet 250,000. Zhukov then check-raised all in and Cousineau let his hand go, sending the pot to Zhukov. Roch Cousineau started with the button and raised it up to 200,000. Viacheslav Zhukov called in the big blind and a flop was dealt. Both players checked here and then Zhukov checked the turn. Cousineau bet 250,000 on the turn and it was enough to see Zhukov's cards into the muck and the pot into Cousineau's stack. Roch Cousineau had the button and raised it to 225,000. Viacheslav Zhukov re-raised to 675,000 and it was back on Cousineau. He raised the pot - enough to put him all in. Zhukov called and the two players turned their hands over. By the time the board ran out , Cousineau's rail were screaming with approval and with the on the river changing nothing, Cousineau scooped up the pot with this broadway straight.